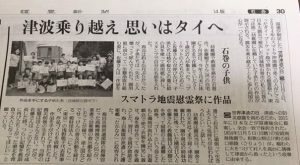 18th Sep 2017, Published on “bridge between Ishinomaki and Phuket ” at Yomiuri News. The two countries that experienced the TSUNAMI disaster will become one. Ms.Asano(Nico Nico General Foundation corporation) has project to From Ishinomaki and Phuket planning good relation. Kindergarten children’s leaf stamp will be send to Tsunami memorial service in Phuket. In this time, we Exhibition the making video and leaf stamp at Tsunami memorial service. World Tsunami Day – 5th Nov.
it was decided to establish November 5th as the “World Tsunami Day”. “TWorld Tsunami Day” was enacted as a joint proposal by 142 countries, including Japan. And, We PLAJA also Holding Tsunami memorial service in Phuket on 5th Nov.